We are considering the coop finished. There are two minor additions to make. 1) Poop boards under the perches so the girls don't soil each other. 2) Put another coat of paint on the porch. The chicks are all settled in and enjoying their new home and run. 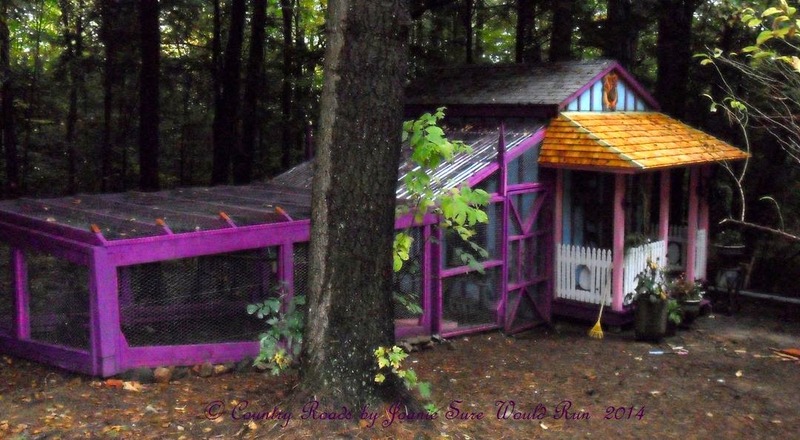 I'm posting one picture here with a link to my web site and picture tour of the coop. I've created a second page of pictures of our happy residents. This will be the last post for this topic. Thank you for following our progress. I hope you will continue to check the above websites for updates. We've managed to get the chicks some run time, even though it's not totally done. If anyone had told me we would still be working on this project 3 months and a day after we started, I would have said NO WAY! But here we are. The chicks love the 10' x 8' area that we've temporarily set up for them. 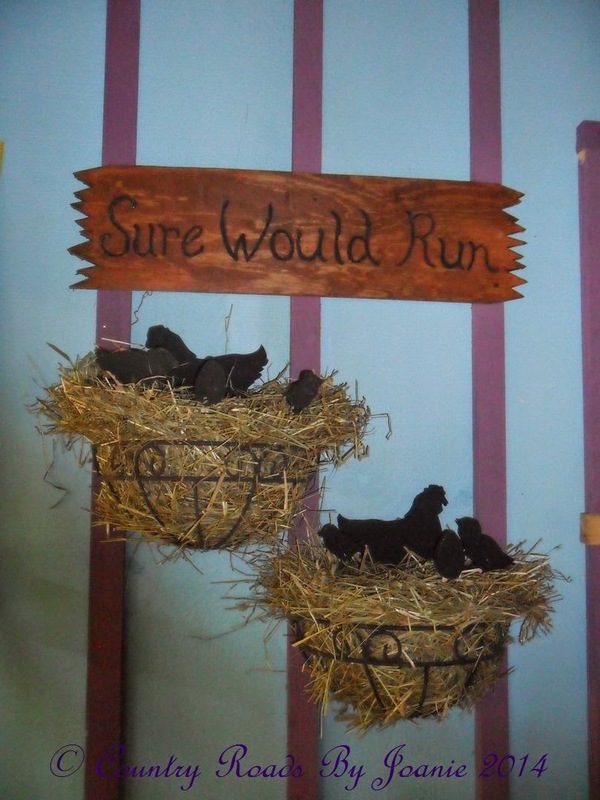 They will be thrilled when it's complete and they have outdoor roosts. We've already warned them that we are expecting not gold, but diamond studded eggs once their living quarters are complete. Their play yard will include a dust bath filled with imported sands, and an assortment of chickercize gym equipment. There is much eggsitement about as news has spread far and wide of the soon to come Grand Opening of Castlehurst at Sure Would Run. Robin Hood is strutting his stuff and Maid Merrihen and her ladies in waiting are fine of feather. Here we are, practicing our entrance. 1/3 a run is better than no run. 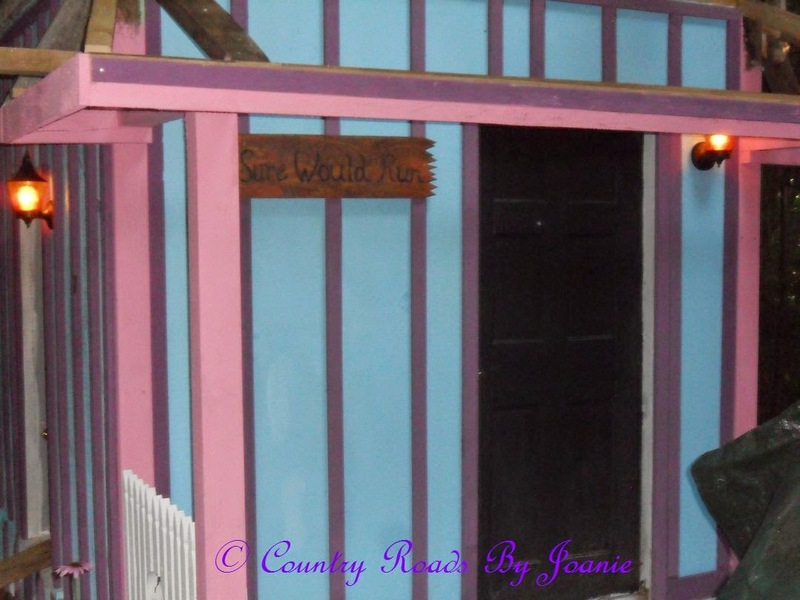 Now that he's done with the front of the coop, I can start working on the railings again and planning my decorations for the rest of the building. I still have the back to do. That is the icing in the cake. I think it will make your jaw drop! Well, enough for today. I'm going to give myself a treat and play a little World of Warcraft before I settle down for the night. Thanks for stopping by! Have a safe and happy weekend! Boy does time fly when you are having fun... or building a chicken coop! We've been busy, busy, busy. It doesn't seem like we've made much headway, but we have. Hubby finished the porch roof today. Next step is to put the siding and battens on the peak. We've got appointments again tomorrow, so I'm thinking we will be done with it by Friday. While he has been working on the roof, I've been playing with my scroll saw and cutting out silhouettes of hens and chicks and the such. You'll have to wait until our project is finished to see what I do with them. In the meantime, here's some catch-up pictures. Door awning painted and installed over window. Hens and chicks and eggs in a basket. Roof is done. Siding and battens go on next! That's all of today. We are seeing the light at the end of the tunnel. Next week we will definitely be working on the run. God willing. Thanks for stopping in! Have a wonderful weekend! We've been working around the weather here. What a rainy summer it has been! We still have much to do. Tomorrow we start installing the porch roof. Hopefully next week we will start working on the run. 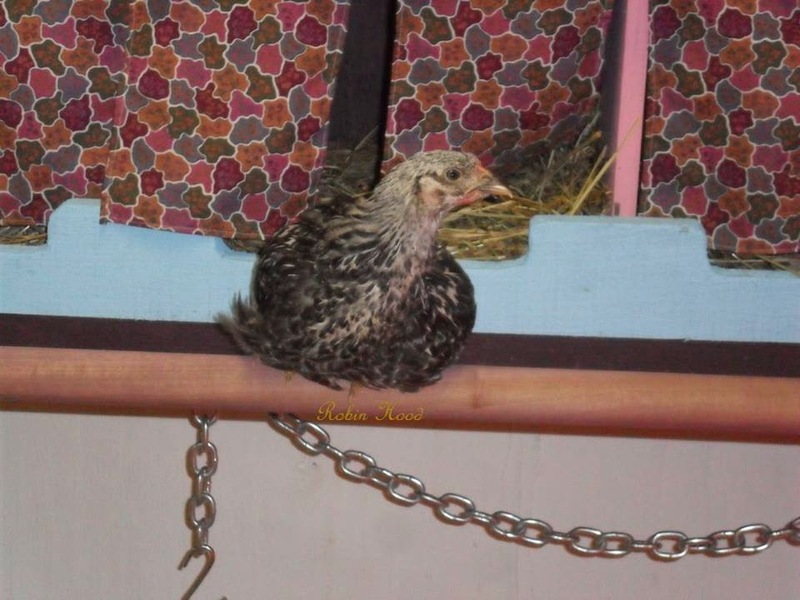 We have to get these chicks outside and running! 90% of the siding and batting is up. There are still a couple of improvements that need to be made inside, but we can hold off on most of them until after the run and roofs are done. 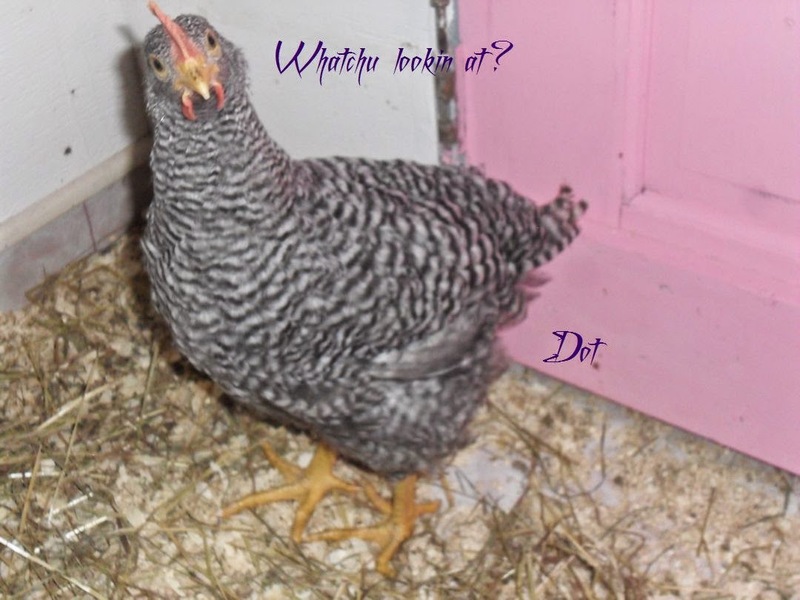 Dot is the largest hen in the coop and she's very vocal. 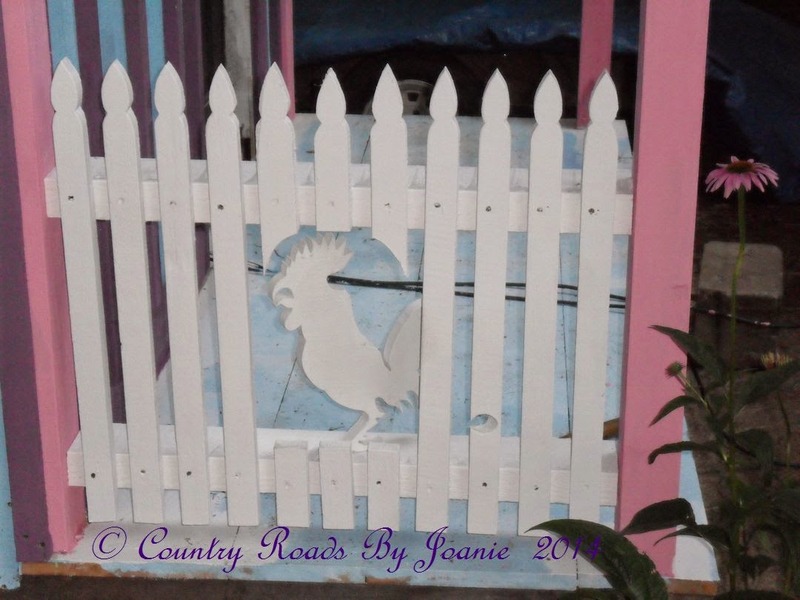 Hubby decided that our picket railing needed a rooster, so he cut this one out. When I told him we needed 3 more for the other railings, he said that was my job. 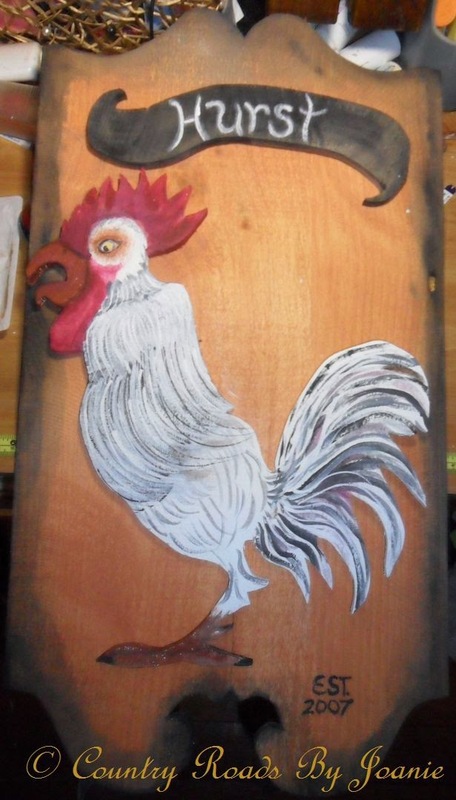 I took out the scroll saw that I purchased 2 years ago and had not yet used, and cut out my first rooster, the backboard and banner. Then spent the evening painting it. I think it's pretty good for my first attempt at using a scroll saw. Siding and battens installed on North and West walls. Partial framing up for the front porch roof. Lights installed and operating, and my Sure Would Run sign etched and stained. We're on a roll here! Deck installed and two rockers for the porch that we picked up at local antique stores. Well, that's it for this post. Thanks for stopping by. I will be posting more pictures over the weekend. Stay safe and God Bless! The weather has not been conducive to working on the outside of the coop. The inside is complete for the time being, and we've introduced the girls to their new home. Hopefully we'll have sunny skies soon, as we need to get the north wall done and the run installed. Zaza and Ava in the foreground... Our Polish girls. Me and the older girls. Oldsters and Youngsters settling in. I posted yesterday and forgot to save. :( So distressing when that happens. Good thoughts gone down the drain. Oh well. Today is another day and there is so much more done. The electricity is installed, but needs to be connected to the main. The ceiling and walls have been painted. 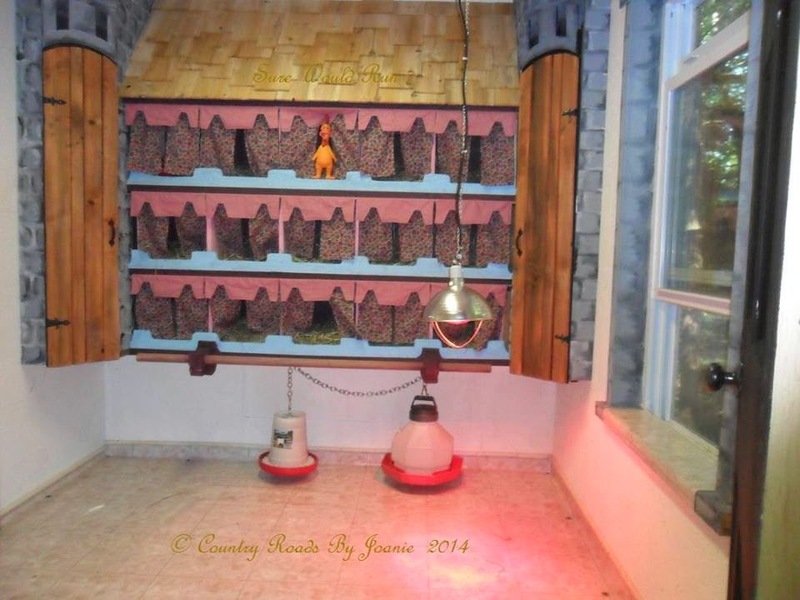 Our custom made overhead lighting is installed and the nesting boxes are complete. 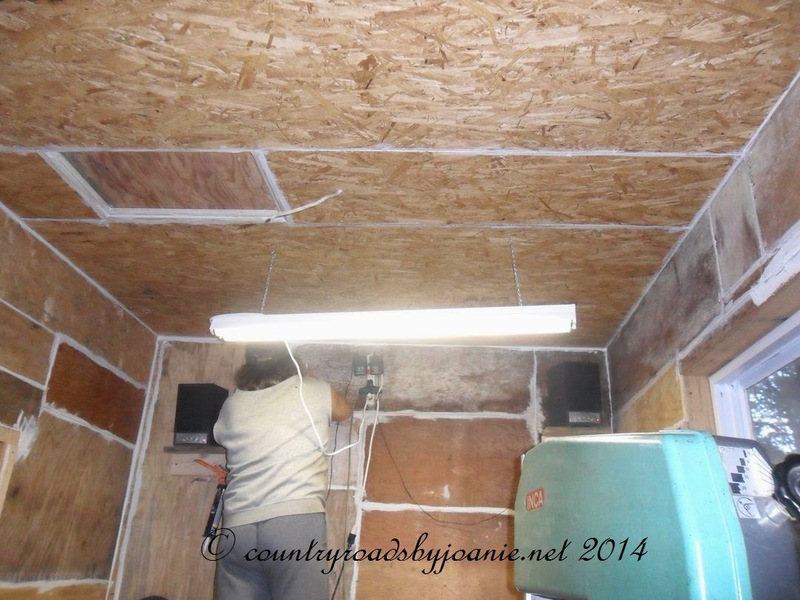 There are still a couple of storage areas that we need to make inside the coop and some trim to be put up. When that is all done, we will install the flooring. I'm hoping we will have it habitable by next weekend. My baby sister Linda is coming to do an inspection. Hubby and I are having way too much fun with this project. Another joint venture. Hubby created the wooden light box. I painted it and designed the stencils that I used to decorate it with. Our doc would say... "Now you're playing." He's right! I mean what else do you do when you pass the age of 65? 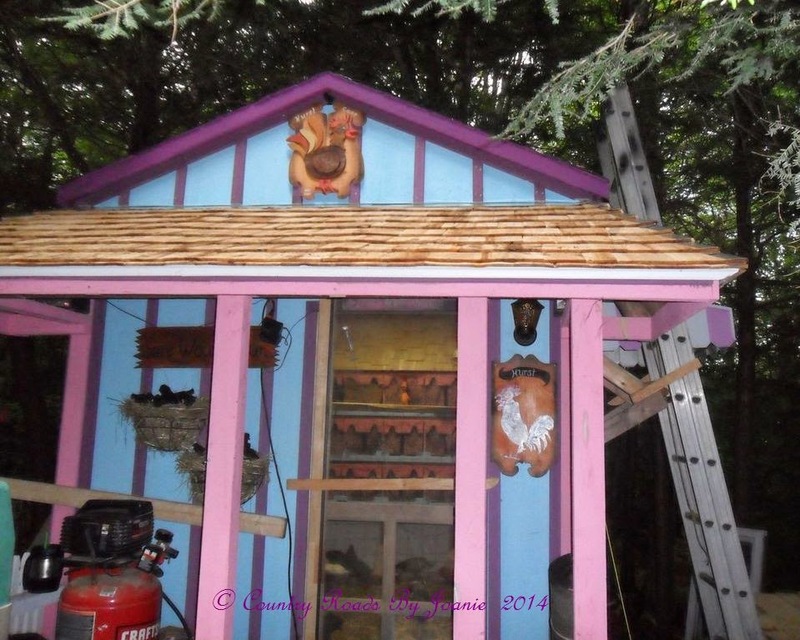 I love the hinged shake covered roof that hubby put over the nesting boxes. It's a place where I can store spare heat lights and other chicken raising stuff. Tomorrow we can paint! Hubby has 2 small pieces to put up and the ceiling will be done. 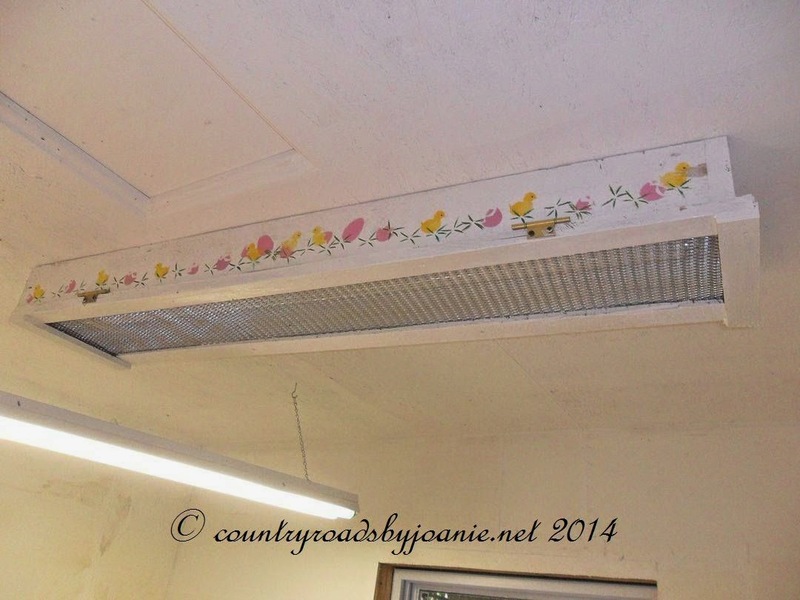 An overhead light also needs to be installed. We made that one rainy day last week. It's hard to believe that everything is beginning to come together. 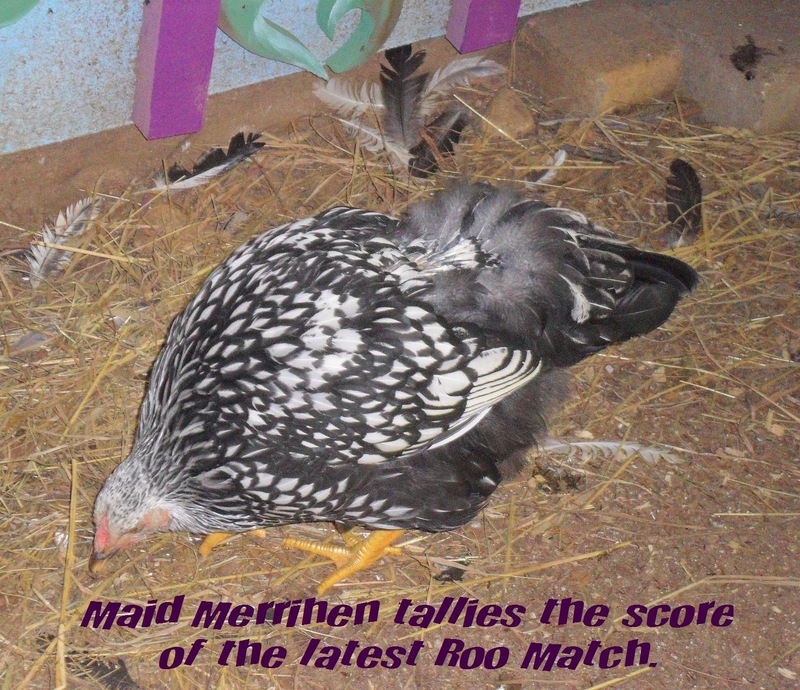 It's a good thing, because Robin Hood, Maid Merrihen and the Ladies in Waiting are getting awfully big! He always amazes me! This particle board is heavy and he managed to put up both 4' x 7.5' pieces by himself! What a guy! Previously had the wrong picture for Molly. Happy 4th! All kinds of fireworks going off around here! Going to be a noisy day! It’s been a few days since I’ve posted. We took a day off due to oppressive heat, and another because of constant rain. Progress is being made. The door frame for the door leading into the run area was made and the window is installed. Inside walls are being installed and caulked to keep critters out. 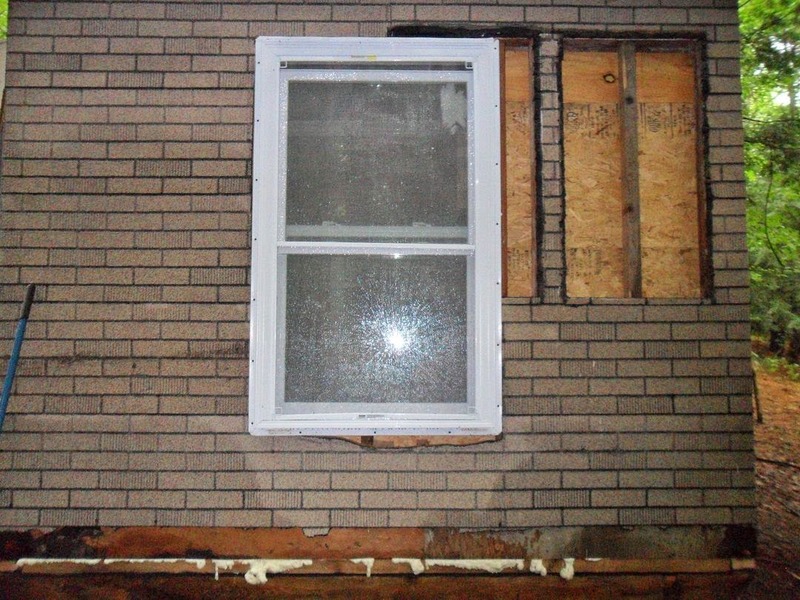 Two small windows were removed and replaced with a larger one. Door to chicken run. Notice door knob is low enough for chickens to open the door themselves. I’ve been drawing sketches of ideas for trimming off each of the outside walls. 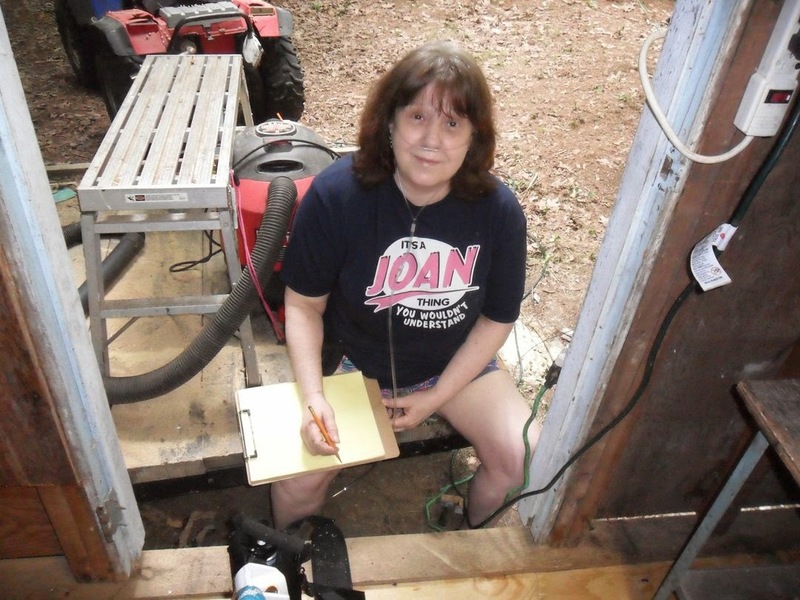 It’s also my job to caulk all of the spaces between the boards on the inside of the coop. That’s today’s project. Hubby plans on moving a couple of the electrical boxes from the basement to the upper level and installing outdoor lighting. The temperature is cooler today, so I know I’ll get more accomplished. The heat doesn’t bother him, but it knocks the living daylight out of me. 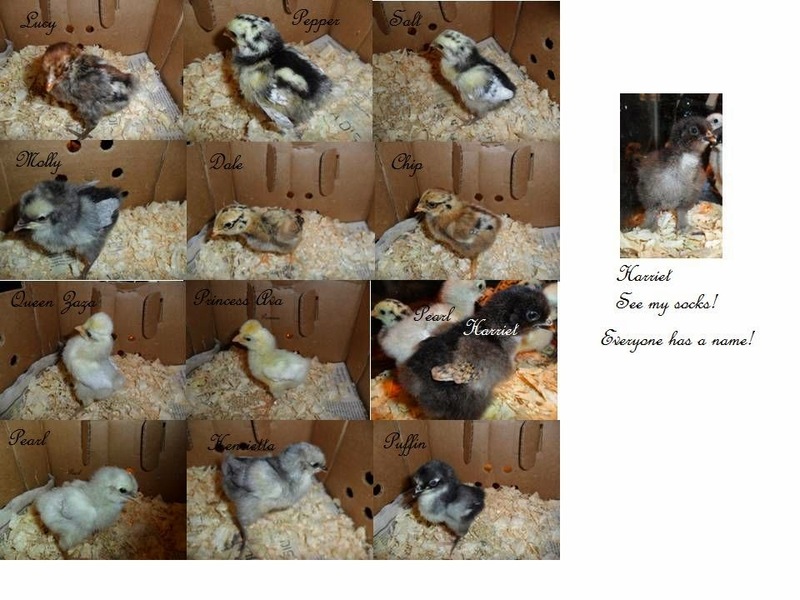 Here's pictures of the chicks. They are getting big! The babies are 11 days old and the others 3 weeks old. Another 3 weeks before the oldest can be put in the coop. Hopefully it will be ready by then. You always order extra because you more than likely will lose a couple due to the stress of being transported at such a young age. We ordered 15 and ended up with 12. We'll know in 6 to 8 weeks if we have 1 rooster and 17 hens. With any luck, if that's the case, we will be getting at least a dozen eggs every day. Time to open up a farm stand! That's it for now. I'll be posting more pics later in the week. Outside siding is due next week, so we can start on that. 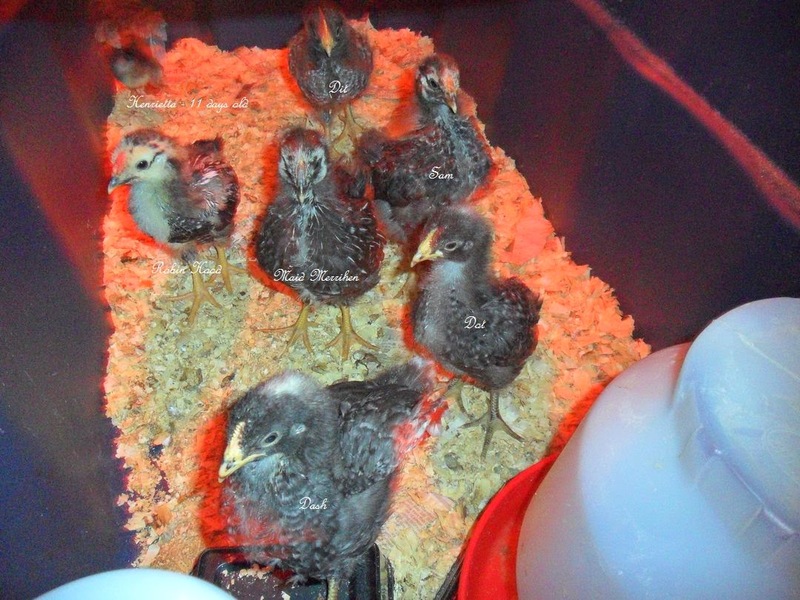 As soon as the inside is secure from predators, we can put the chicks outside in their brooding boxes. They will be plenty warm with the heat lights going 24/7. Can't wait to get my dining room table back. Have a safe and enjoyable 4th! Hubby had to call in the big guns (me). The building had to be lowered onto the foundation. There are two major problems. 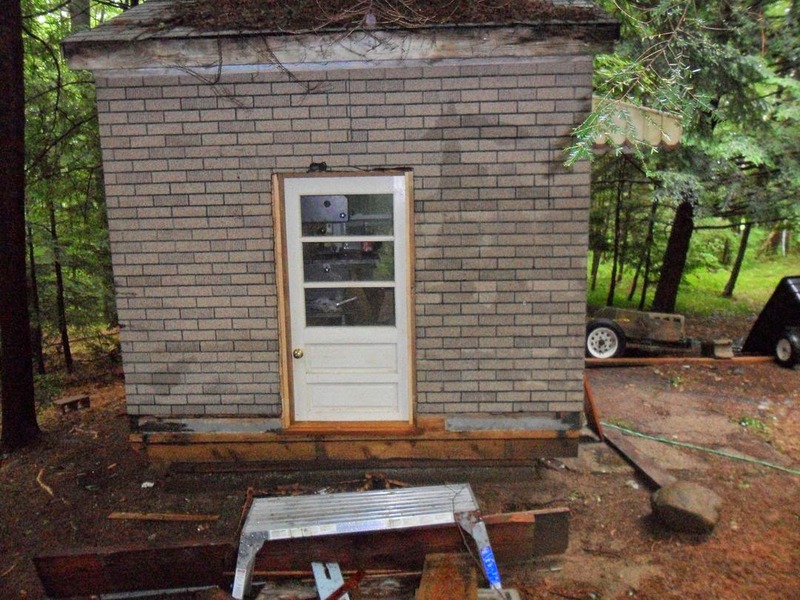 1) the foundation is 8' x 10', the building is 8' x 12'. 2) The back side of the building is 4" wider than the front. None of the corners are square. Hubby putting the last piece of the floor puzzle in place. This piece is really appropo as this whole coop project is one big puzzle. Picture of hubby watching me work on the recessed handle. We had just finished measuring and laying the last pieces of the floor. Recessed hatch handle that I routed out and mounted for hubby. We are now entering the fun part of the conversion. 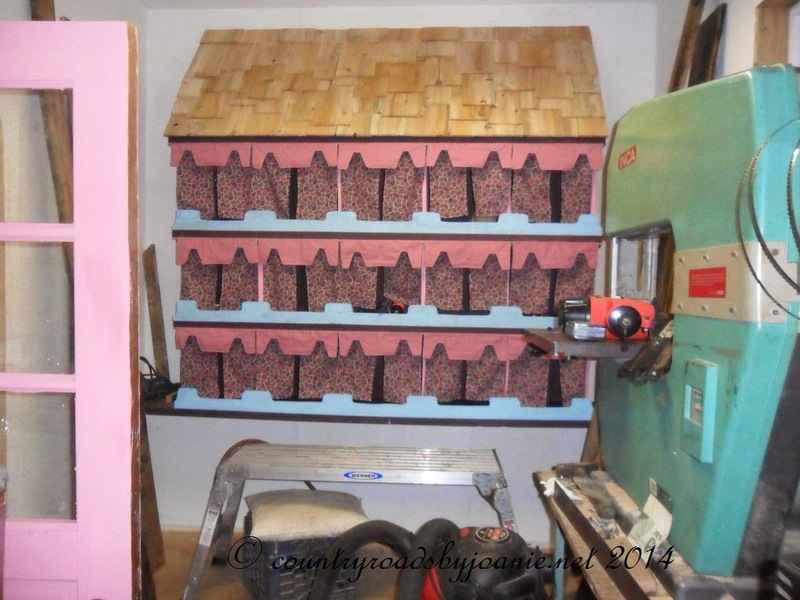 We're going to add a couple of windows, then it will be time to start installing nesting boxes and perches. Also going to put pine siding on the outside so that will need to be painted. Hopefully it will be ready for habitants in 2 weeks. The fledglings finally left the nest on the 1st day of summer. Not too soon for hubby. 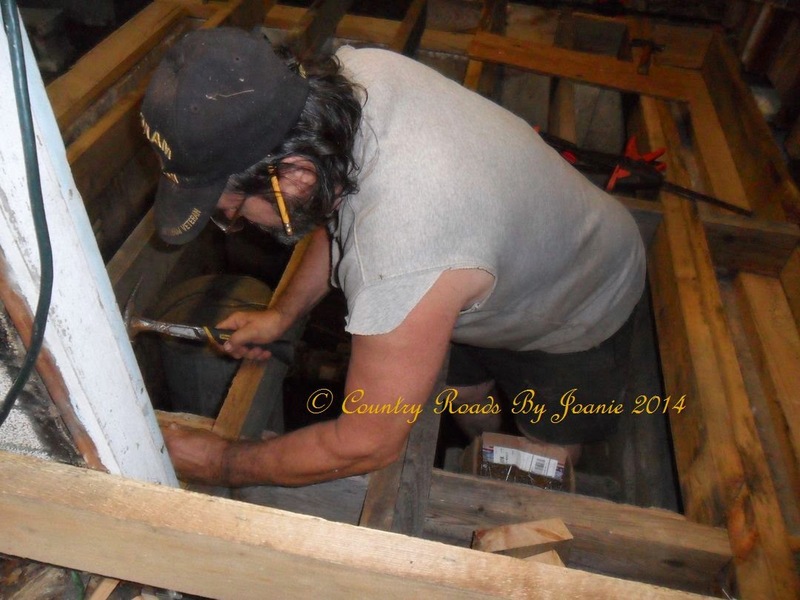 He managed to get the sill plates down and realized when he went to put up the floor joists that he was short on wood. A quick call was made to our friendly lumber yard, and arrangements were made to pick up the boards at 9 AM today. I can't believe all that he's accomplished in 8 hours. All of the joists are in place and he's now putting in cross beams. What a guy! While he was busy outside, I spent my time indoors doing some minor repairs, cleaning, bread baking and studying up on raising chickens. Needless to say, we both are ready for a good night's sleep. Baby birds are still in the nest 24/7, holding up construction. Hubby put a safety net up just in case one falls. In the meantime he's grinding away at nails and bolts that are in the way. East side sill plate in place. :) 3 to go! All of the rotted wood has been removed around the building with the exception of that which is located directly under the bird nest. Fledglings are still in the nest. Plenty of other things to do in the meantime. All removed but the left hand corner. Enjoy the day! Stay safe! 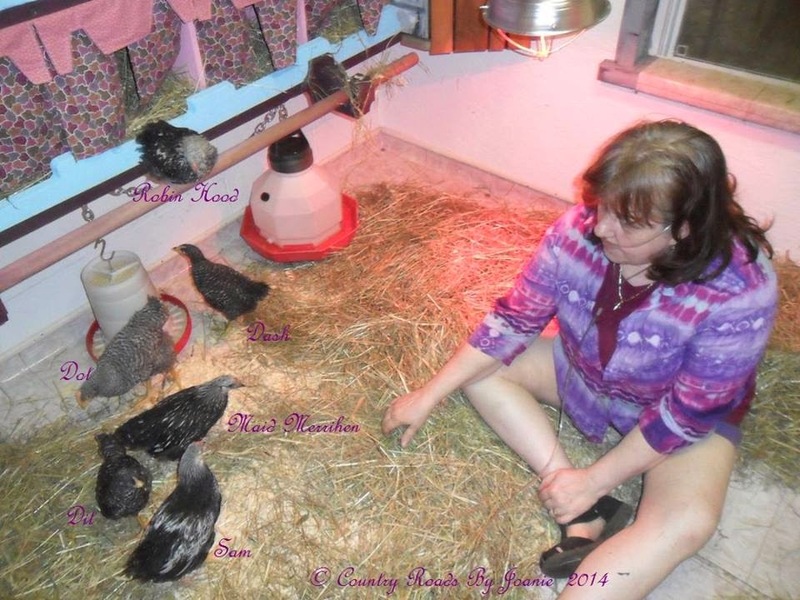 I've been after my hubby to let me raise chickens for 7 years. He finally agreed that the work would be worth the health benefits. 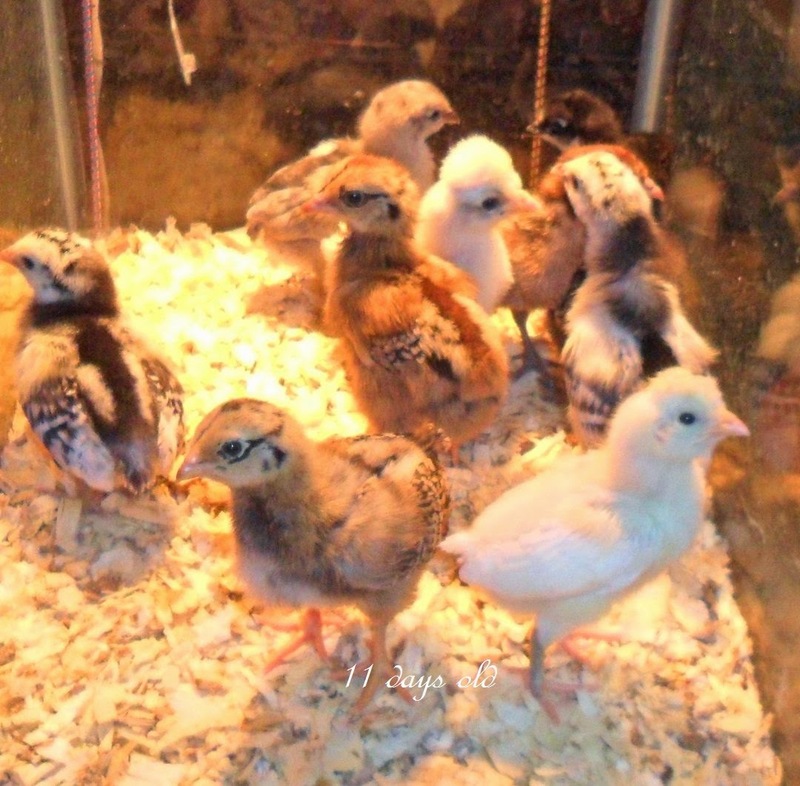 On a recent outing in search of herbs for my garden, we found that our local feed and plant store was taking orders for chicks. 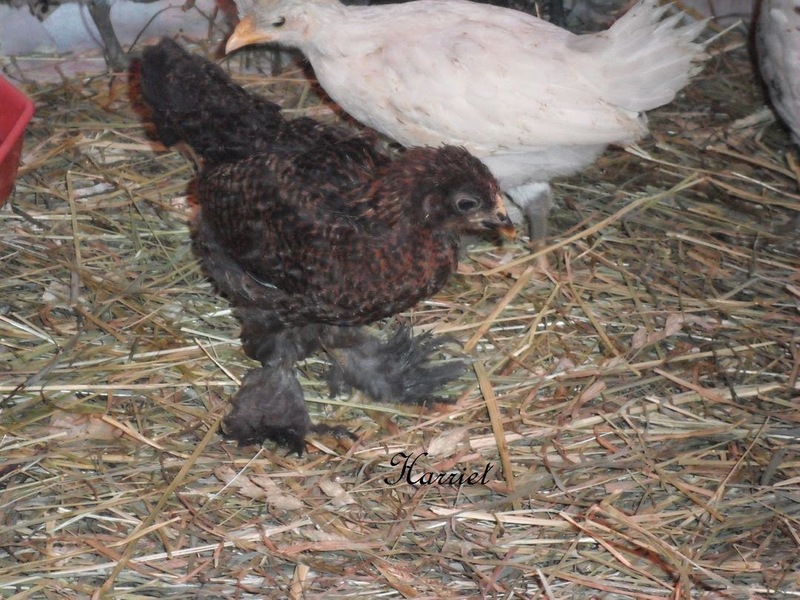 We placed an order for 5 pullets and 1 rooster. (I'm now wishing we had ordered 12, just in case we lose a couple in the growing process.) The chicks arrive on 6/13/14. First question was where to put them. We have a retired pump house that we were going to convert into a potting shed with attached greenhouse. He said if I gave up my potting shed, we could put the chickens in there. Thus began the project of the Chicken Coop. Before picture of pump house. We had been using it as a storage shed so it had to be emptied first. Opening cut for entrance into future fenced in area. This is where everything became more involved. We had already purchased 75' of fencing for the pen and the lumber we anticipated needing to make the building habitable for human and fowl. When the cut was made, hubby found that the sill plate was rotted in that area along with the uprights. After a thorough inspection, hubby determined that the bottom 18" of the building has to be removed. Quite the task for sure. We spent a day trying to determine the best way to address this situation. The rest of the structure is in excellent condition, so it would be a waste to knock it all down and rebuild. Hubby put his engineering skills to work. A picture is worth a thousand words. One side down, three to go! The west side is ready to be cut out, but construction is halted as there is a nest over the doorway with 7 babies that hatched. Can't do any more construction until the babies are out and about. It's a good thing that there are other projects he can work on. He'd rather be busy, so relaxation is last on the list of things to do. This is the pump and water tank in the basement which is connected to a shallow well that we stopped using in 2010. Last we knew the pump still worked. 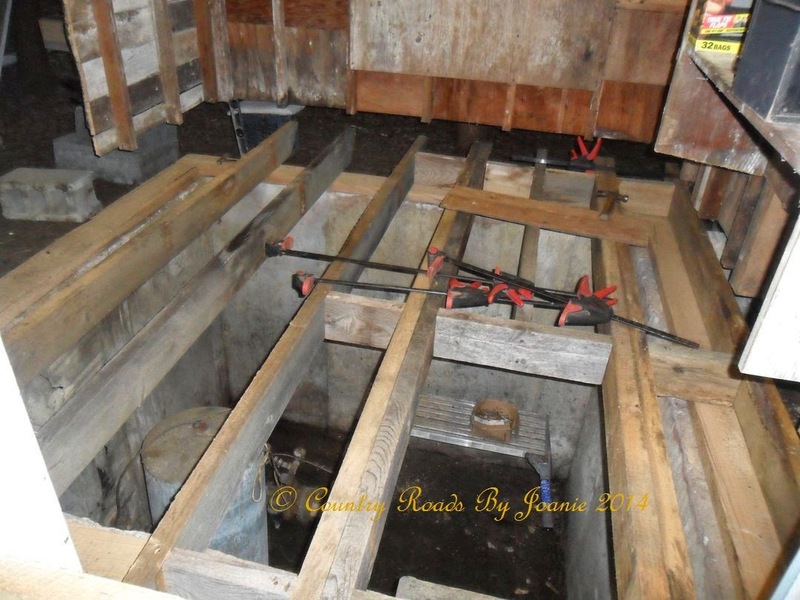 The plan is to add plumbing to the upper level so that we can use the water for gardening. That's all for now. It's been pouring all day and more rain is in the forecast for tomorrow. Between the rain and the babies, construction won't resume until possibly Saturday. Friday we pick up the chicks! With this all said and done, I'd best log off and dig up the aquarium I'm planning on using for their first home. Look for a Chick Page on Saturday! Thanks for stopping by.... Leave a comment if you wish. Yes, you can remind me how crazy we are!